Spoiler Warning! This review talks about the plot of the graphic novel being reviewed. I try to avoid mentioning anything I see as a major twist or reveal, but I don’t guarantee it. Read at your own risk! Godzilla: The Half-Century War was originally published a few years ago and collected in paperback. IDW has now re-released the collection in hardcover format with endnotes by James Stokoe, the writer and primary artist of Half-Century War. I had never read HCW before, though it came recommended, and now I can add my own voice to those that laud it. In my review of Godzilla: Cataclysm earlier this year, I made no secret of my love for the Big G, and I think Stokoe loves him at least as much as I do. Half-Century War is the story of Ota Murakami, a young lieutenant in the Japan Self-Defense Forces when Godzilla first attacks Tokyo in 1954. He and fellow tank crewman Kentaro Yoshihara fight Godzilla up close and personal in that battle and subsequently join the Anti Megalosaurus Force, a name taken from the movie Godzilla Against Mechagodzilla. We follow Ota with the AMF to Vietnam in 1967, Ghana in 1975, Bombay in 1987, and Antarctica in 2002 as they intervene in attacks by Godzilla and other Toho monsters, the result of a former AMF scientist altering a failed Godzilla-repelling machine into a monster-attracting machine. While the story is interesting, Half-Century War’s bread and butter is the art. Pages four and five of issue #1 are a stunning two-page spread that reveals Godzilla fully. He’s gigantic, crushing a train underfoot as buildings collapse behind him. This is unmistakably Godzilla, but with a distinct aesthetic unique to Stokoe. Godzilla’s back ridges are incredibly prominent and look sharp enough to cut. His teeth and claws look dangerous, and his scales look like segmented, impenetrable armor. His eyes have no pupils, only a dark green, untextured iris surrounded by yellow. I loved this rendering of Godzilla. He has immense, palpable weight, and his very presence is destruction, as in Vietnam when blue skies fade into smoke and a vague red glow in Godzilla’s wake. The blue aura that appears around him as he charges his radioactive breath has that essential ephemeral quality, and the breath itself is devastating. Stokoe and Heather Breckel used an amazing palette to color this book. That two-page spread in the first issue is only the first of many, but each one made my jaw drop, especially the spreads in issue #3. In the first, Ota sits with knees drawn up in a partially destroyed building while a monster battle royale plays out in the ruins of the rest of the city. Rodan, Battra, Megalon, Kumonga, Godzilla, Ebirah, Hedorah, and Mothra are all there. In the next spread, some pages afterwards, a Mothra-painted hippie van swerves through the destruction while Godzilla fires his breath past the continuing melee. The monster fights are brutal, from the first appearance of Anguirus in Vietnam to the final showdown between Godzilla and a team-up of Gigan and King Ghidorah. Mechagodzilla and Spacegodzilla also put in appearances in a marvelous three-Godzilla battle in issue #4. The absolute destruction these creatures wreak is nothing short of awe-inspiring as Stokoe renders it. He adds minute detail and exquisite care in every scene, especially to clothing and machinery. Every bit of the lettering is as amazingly expressive as the figure work. As Godzilla stories go, I like Half-Century War’s plot a bit more than I like its execution. I like the idea of following one person through Godzilla’s recurrences, and I especially like how Ota develops. He gains an obsession with Godzilla from that very first day in Tokyo, and he wages his own personal war against the beast. As he grows older and finds he can’t defeat Godzilla, he starts to believe in Godzilla as a constant, something inevitable. He becomes convinced that after he dies, Godzilla will remain, despite an earlier belief that he would be around to see Godzilla’s end, just as he saw the beginning. He even becomes inured to Godzilla’s presence, in a way, evidenced by his casual manner as he steps out of a van for a cigarette while Godzilla slugs it out with Mechagodzilla. Minor characters naturally get less focus, but they do feel unique. Ota’s fixation is contrasted with Kentaro’s stalwart go-with-the-flow attitude. He’s reluctant to join AMF until Ota accepts, and he adds just enough levity to keep the story from being bleak. Doc Randall is only in the series during the Vietnam issue, but with his bald head, wild, bespectacled eyes, and distinct mustache, he stands out. Stokoe also introduces the idea of teams formed specifically to research and combat each monster, just as Ota and Ken specialize in Godzilla. There isn’t enough room to give them much depth, but their aesthetics are tailored to their monster in clever ways. For example, Mothra’s team is a pair of 70s hippies, and Hedorah’s team wears environment hazard suits. Stokoe put thought into the kind of people who would be interested in a particular monster, and it shows. My issue with HCW’s execution probably stems from the necessity of covering so long a time frame in only five issues. The first few pages of each issue requires playing some catch-up, which means we’re jumping in and out of a story that I think could have been something truly amazing as an ongoing with more room to develop. We don’t know anything about the monster-attracting machine when we first see it at the end of issue #2, even though context makes it clear it was Godzilla’s target. We learn about Deverich, the former AMF researcher who built it, in issue #3, when Ota has already been trying to track him for eight years. Often I found what’s skipped to be more interesting than the incident at hand, the constraints of a miniseries notwithstanding. Truth be told, it’s a testament to Stokoe’s ability that he was able to fit so much into the five issues of HCW, even if I would have liked to have seen more of it. Though not my favorite Godzilla story, The Half-Century War does rank highly, and it features plenty of what goes into a great Godzilla tale. 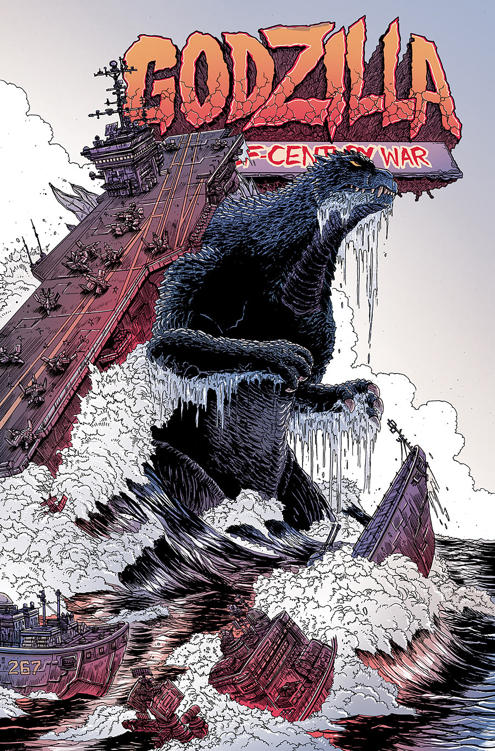 I hope I have a chance to see more Godzilla work by Stokoe in the future, because he doesn’t just love Godzilla; he understands what makes Godzilla good, and he knows how to execute it. Devil’s Due Squarriors Hardcovers on Kickstarter!